Pretty colors! Fun stripey shorts! Sleeves!!! Seriously. What's going on here? Thankfully, even Michigan has their limits. 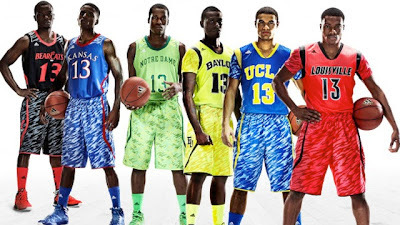 SportsBusinessDaily.com reported Wednesday that adidas will be rolling out college versions of its short-sleeve basketball uniforms for the NCAA tournament. Michigan, however, won't be wearing them. "Officials at Michigan and N.C. State, two other adidas schools in position to make the NCAA tournament, said they will not wear short-sleeve jerseys," the site reported. I think the combination of Outback Bowl uniforms and then the all-maize basketball unis against Ohio State have officially, finally, put me over the edge. Adidas needs to stop this. And if they don't stop it, then Michigan (@davebrandonad) needs to simply stop giving in for the sake of just trying to appear "hip". You know what's hip? Winning. Tradition. Greatness. Can we please declare the end to this ridiculous alternate uniform era? It's clearly driven purely on merch sales, nothing more. Do the players really love them that much? Fans? Seems to me the public/media/blogger backlash is hardly worth the revenue from Adidas. I wasn't a huge fan of the Outback uniforms simply because they were identical to the Cowboy Classic uniforms, just flipped. I don't understand why we can't reuse alternate jerseys. If you try out something like the Cowboy Classic jerseys and people love them, why not reuse those instead of making a brand new one? Personally, I thought both looked better than Michigan's traditional away jersey. Not better than the home jersey of course, but at least the away jersey. I was also a fan of the all maize jersey for basketball. I know a lot of people had mixed feelings, but at least it appears to be a one time thing and the basketball team isn't known for a traditional look. The basketball jerseys usually undergo some pretty big changes every few years so I'm not sure if the "tradition" argument applies to them, at least not as strongly as in football. I'll agree with you about the normal football away unis being bad. They are. We haven't had a decent away uniform in the Adidas era at Michigan. Basketball sort of gets a pass because it's basketball. And at Michigan, the uniform doesn't carry the same significance as football does. But I think the full weight of all of these alternate looks is just wearing me out...football and basketball. You can make an argument for it each time by saying that it's just a one-time thing for that look...but it's happening all too often. And the different looks Adidas is coming up with aren't that great. I'm just over it. I dont see why people complain about new jersey designs. Its the future of basketball and football. And the new futuristic styles (in my opinion) are great. Those jerseys look sweet. Its not always about tradition. And i loved the Outback Bowl and Cowboy classics. They both are better than our normal home and away if you ask me. Now its time to change the yellow pants. If not rid of them than put a strip on them like Baylor or something. I mean we are Wolverines and youd never know it. But of course we need to keep the winged helmets.